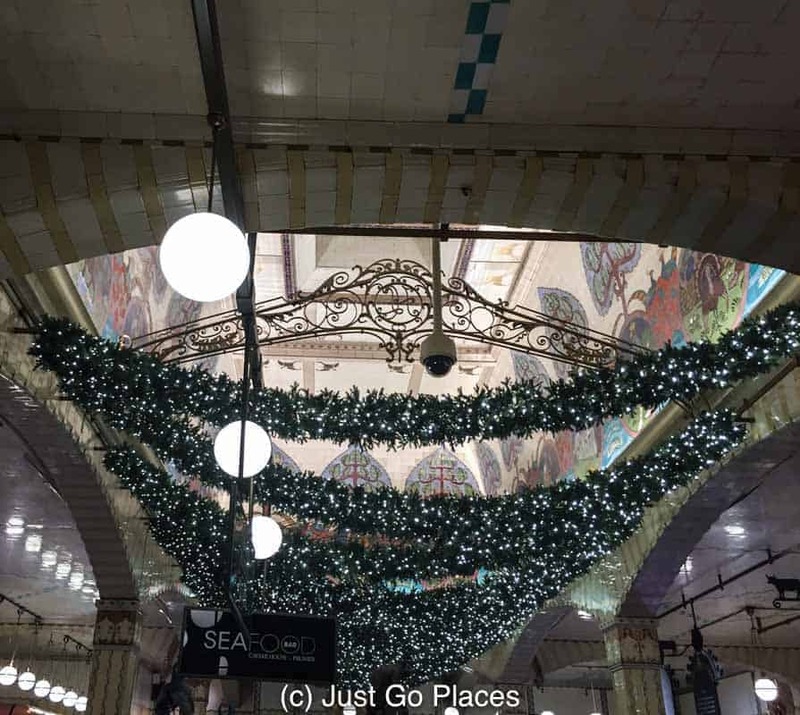 If you haven’t had a chance to visit London this Christmas, I’ve got a virtual tour of festive events that will have you planning to visit London next year in December! 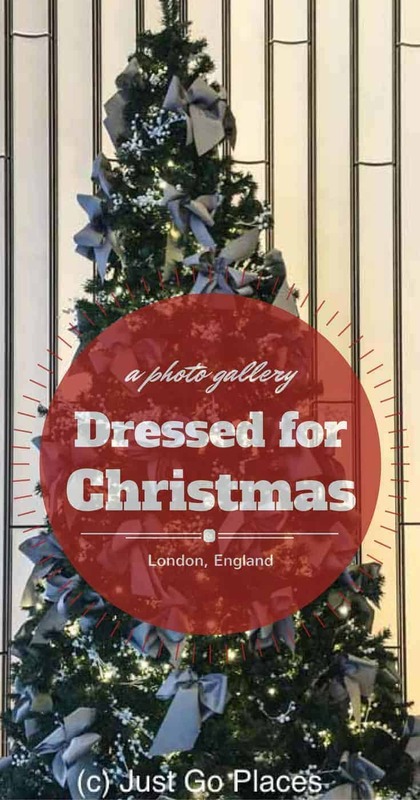 From the City of London to the West End, Londoners take Christmas very seriously. 4.1 The Lights, The Trees etc. 4.2 Join our growing community of readers! 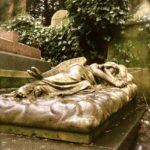 Dennis Severs was an American with way too much money and a love for period architecture. 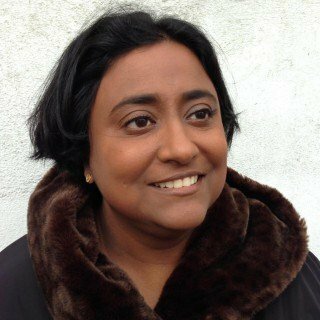 He restored a house in Spitalfields where the Huguenot silk weavers had settled in the 18th century after they had fled persecution for their faith from France. The house is now ‘still life drama’ with each floor showing how the fortunes of the house (and occupants) fared from the 19th century to the 20th century. For Christmas the house is decorated like it would have been during the period portrayed included smells and noises. I really did feel like I had my own Ghost of Christmas past leading me through the house. Needless to say, the Victorian period did make you feel you were hanging out with Tiny Tim from A Christmas Carol in all of their sad squalor. 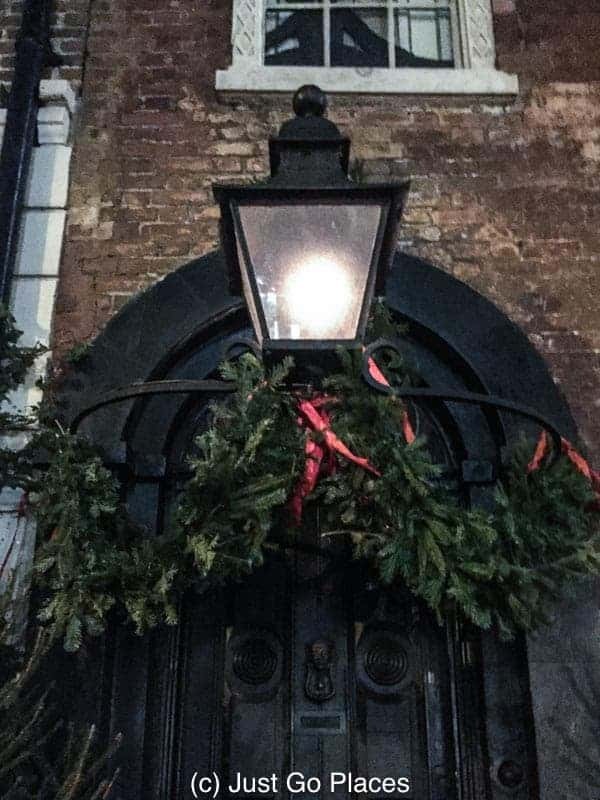 The entrance to Dennis Severs’ House lit with gas lamps. No photographs are allowed inside the house but the museum does have a YouTube video showing you what to expect. 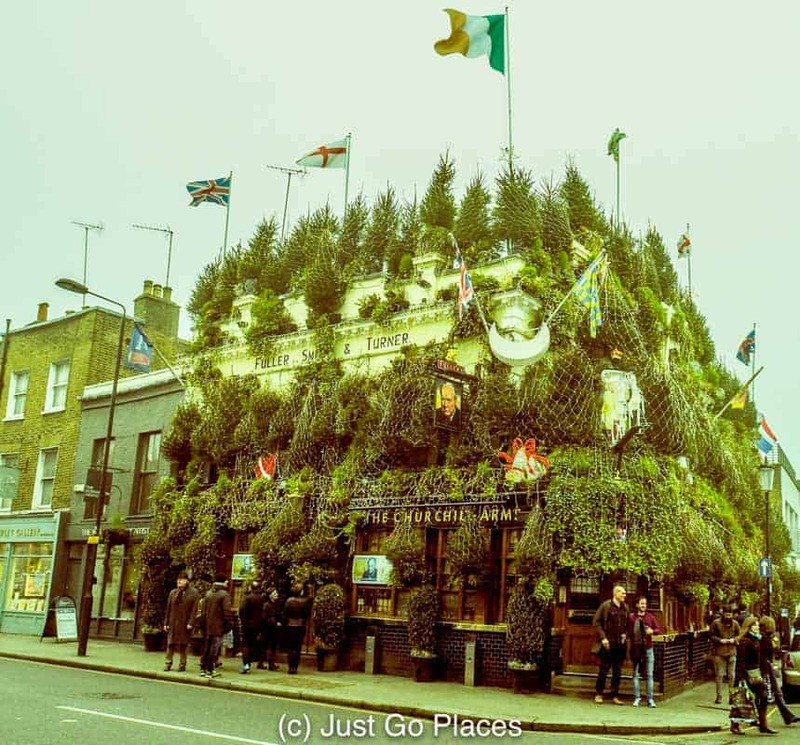 The Churchill Arms in Notting Hill in London has been called the most festive pub in London. It’s got 90 Christmas trees strapped to its outside and is decorated with 21,000 lights. I would say having a pint (or two) inside counts as a festive event in London don’t you? 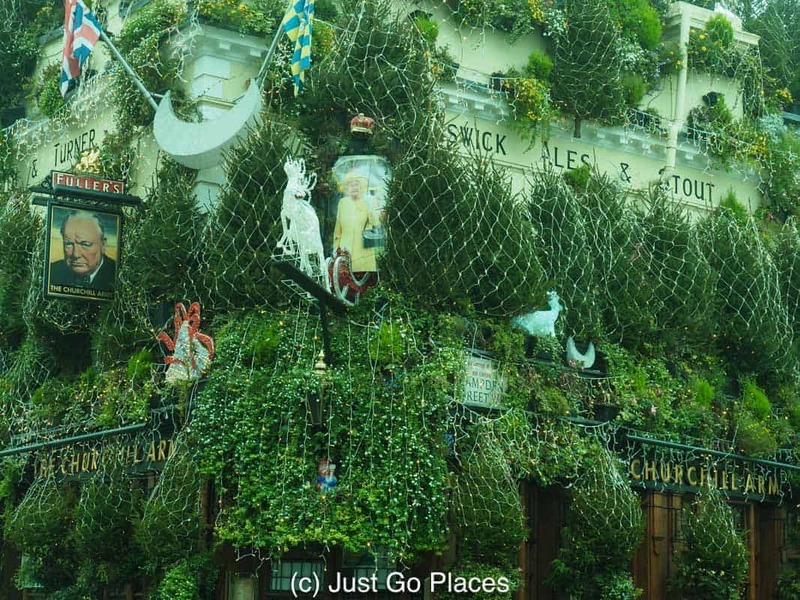 The Churchill Arms in Notting Hill is as festive as you can get. The trees are all held up by netting. Let’s hope a strong wind doesn’t blow! Harrods this year went with a very British fairy tale Christmas theme. The windows were decorated with mannequins of children and animals. I guess in times of world uncertainty it all goes back to children and animals (and very expensive accessories). 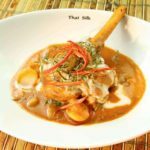 I found it underwhelming – perhaps all in just too good taste. Let’s face it, no one goes to Harrods to experience good taste. 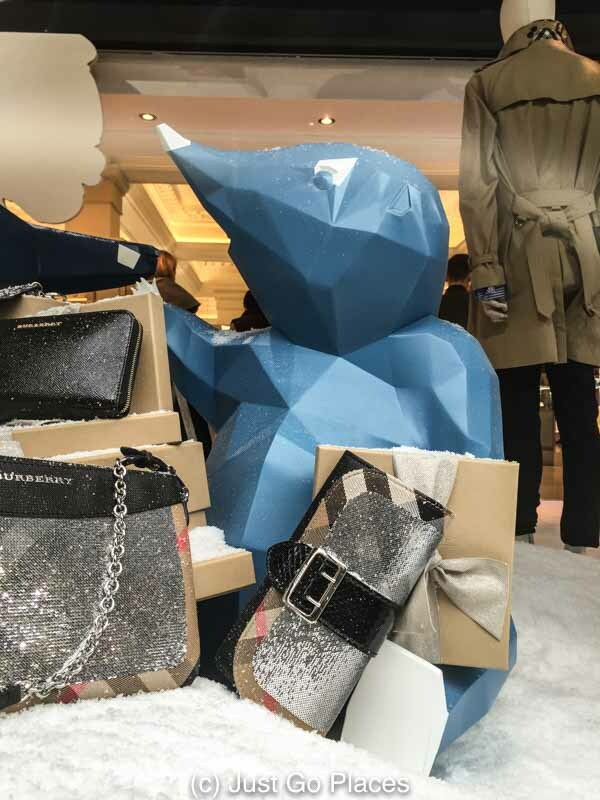 Geometric animals and expensive accessories in the Harrods’ windows. 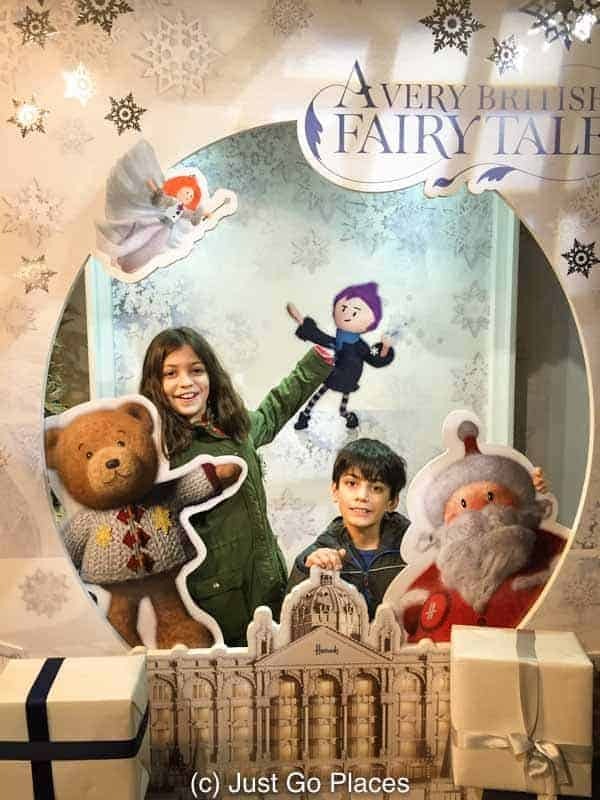 One of the funniest things we saw in Harrods this year was a mother chasing her child who was wailing that she wanted her Elsa doll NOW. The 3 year old was too fast for the mother who was teetering around in heels. I’m sure the mother was thinking that quality time with her child was overrated. The Santa Grotto at Harrods is in the massive toy department. The appointments open in August and it is usually full up by October. I remember taking my kids to the Santa Grotto each year and dreading having to go through the toy department. It definitely is a lesson in fortitude. My daughter punching a very British festive fairy (inadvertently). 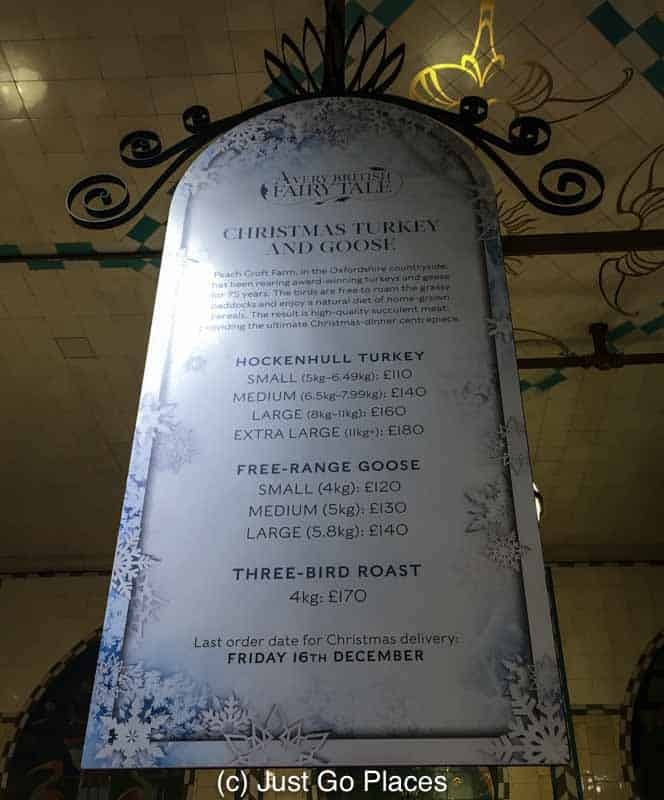 The Harrods Food Hall has great gifts if you need something easy to give someone you don’t know very well. It’s easily packaged and the Harrods name conveys that you care (enough to pay over the odds). The food hall decked out for the holidays to distract you from the prices of the products. These prices are fine if you send your butler to shop for Christmas and you don’t see the bills. Like in Paris, New York and other big cities, the big hotels and department stores do very creative festive displays. The Mandarin Oriental Hotel decked out for the holidays. 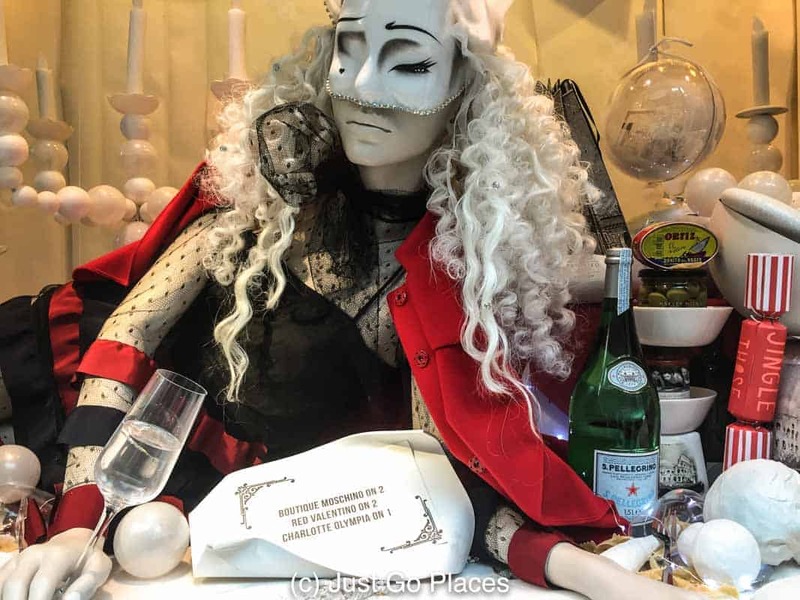 The Harvey Nicks window displays were not as colorful as last year. They were more interesting though than Harrods. A certain Let Them Eat Cake attitude prevailed. 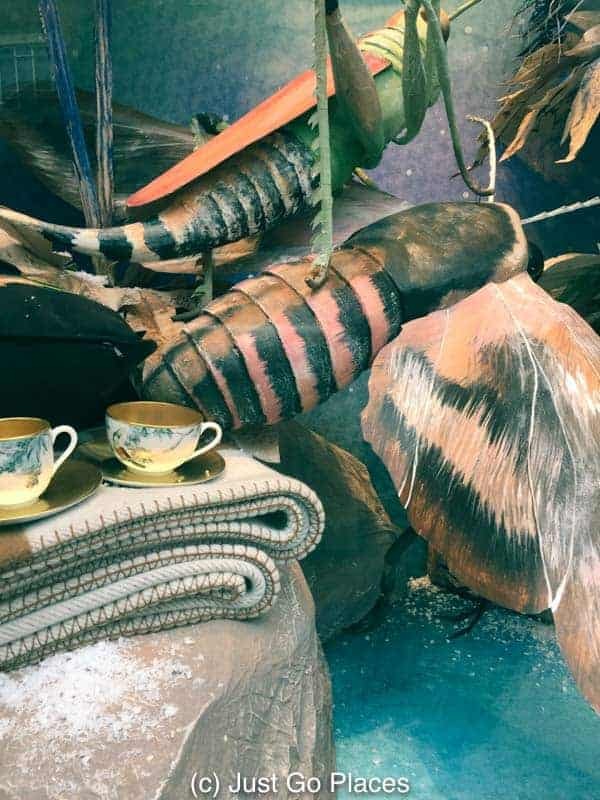 I have no idea why some of the stores in London and New York both insisted on having insects in their windows. I personally found it creepy even if the fashionistas declare that insects are a big thing for next season. Because nothing says Christmas like giant creepy-crawlies. 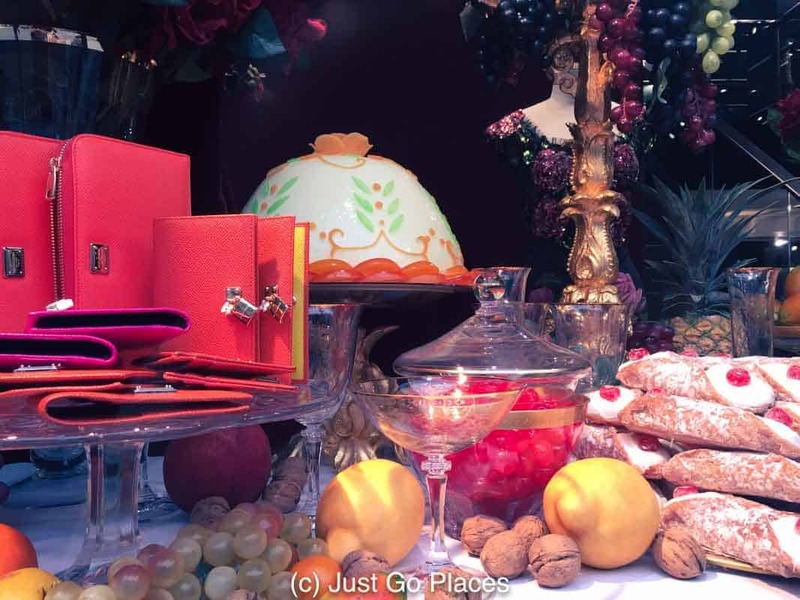 Dolce and Gabbana went back to Sicilian roots with a decadent store front display. I’ll take the bags, leave the cannoli. The Lights, The Trees etc. My favourite tree this year was in front of the art school, Central Saint Martins, in Granary Square in Kings Cross. 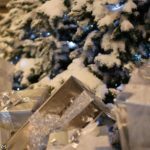 The 17 foot Christmas tree with 1200 lights is frozen in resin created to look like a giant block of ice. The ice puddles into the fountains in which it is located in an effect created by 550 pounds of melted clear wax. It’s called “Fighting Fire with Ice Cream” by Alex Chinneck who is known for creating OTT public works of art. It’s called Fighting Fire with Ice Cream because “Christmas Tree in Ice Block” would have been too bourgeois a name. 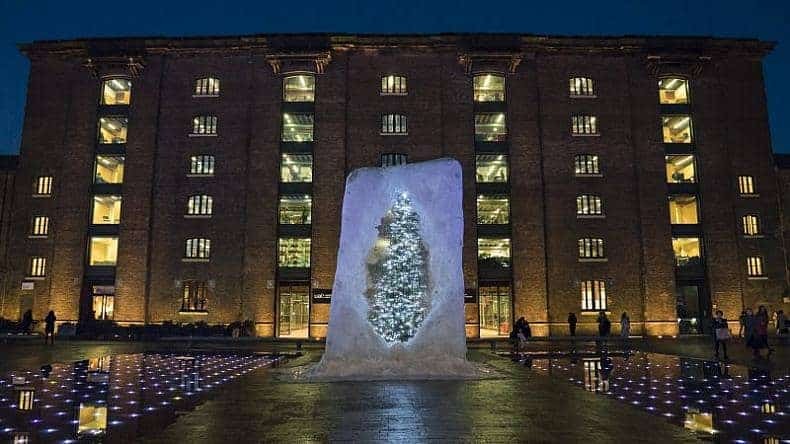 The Christmas tree in a block of ice: as cold as the spirit of the season captured in the heart of capitalist London (or something like that) Photo credit: Kings Cross. What do you think? 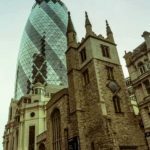 Would you now consider coming to London in December? The days may be short and dark, but there is plenty of sparkle in the city nonetheless. 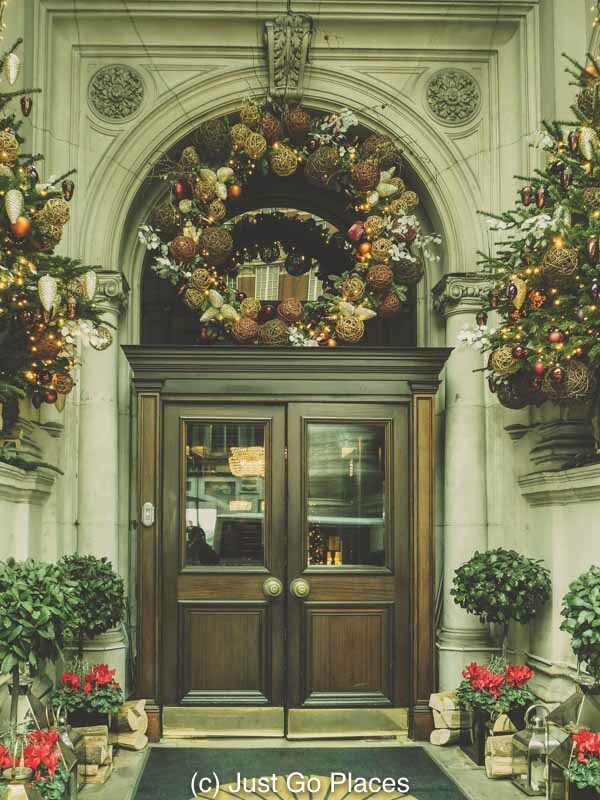 London is at its finest during the Christmas season and your lovely photos do indeed capture the holiday spirit. Thanks for sharing and happy Holidays to you. you too! Thank you for stopping by! Ahh, this takes me back. I loved going to the Christmas markets and seeing the wonderful window displays in London when I lived there. Lovely stroll down memory lane! I would love to visit this house during Christmas time when it’s decorated. I particularly liked the video with the dim light and the delicious food platter. Christmas time is really a wonderful time..and miracles happen during this time. It was gorgeous! The whole house is lit by candle light and so the night visit at Christmas time feels like it really was back in historical times. I haven’t either! 90 trees perched on a rooftop is a bit OTT. Aww no-one does Christmas quite like London 🙂 It makes me feel nostalgic for England!! The British love Christmas! I love their enthusiasm for it too. 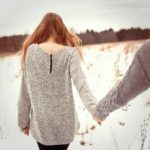 You would have been here for the January sales which are an event in themselves. Christmas time is definitely worth visiting! OMG! That pub is hilarious! I’d love to see that in person and visit at night because I’m sure with all of the lights it looks quite different. That tree in the ice is always really intriguing. Some places just really go beyond with the holiday decor. I LOVE it! Great post. Makes me want to take that trip to London I keep planning, but putting off. London is very cheap now thanks to Brexit so you should definitely visit in the next couple of years. That Christmas tree in that block of ice is beautiful! I’m not digging the insects in the windows, must be a thing! The outdoor ice skating rink, along with all the sparkly lights look amazing! It really is cool isn’t it? Don’t call it a Christmas tree though:-) It’s something to do with ice-cream. I’ve always heard of Harrod’s and wondered what their displays would look like. I guess I was expecting over the top but that may distract people too much from their goods? 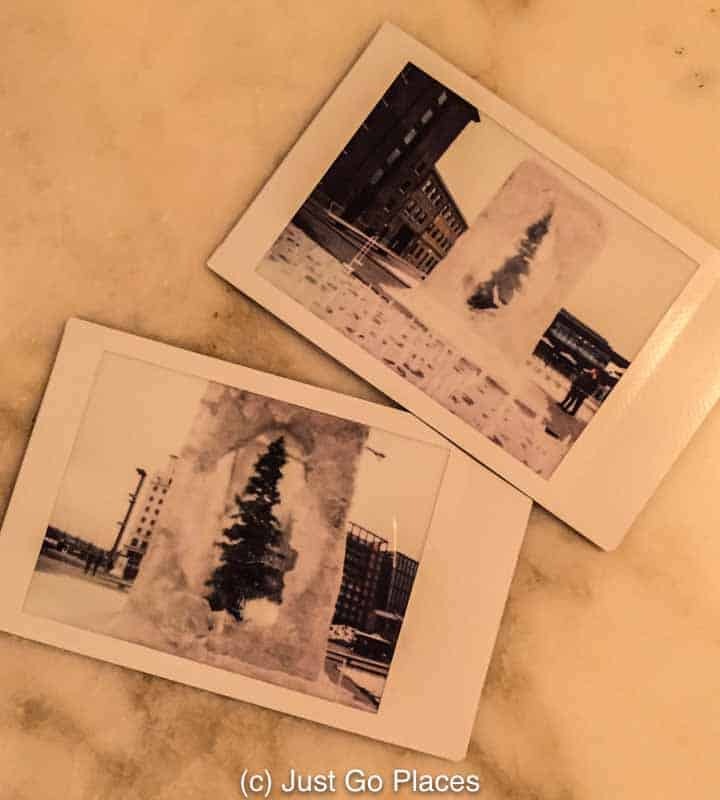 Anyway, I really like the looks of that Christmas Tree in a block of ice. Such a simple concept, but very cool. 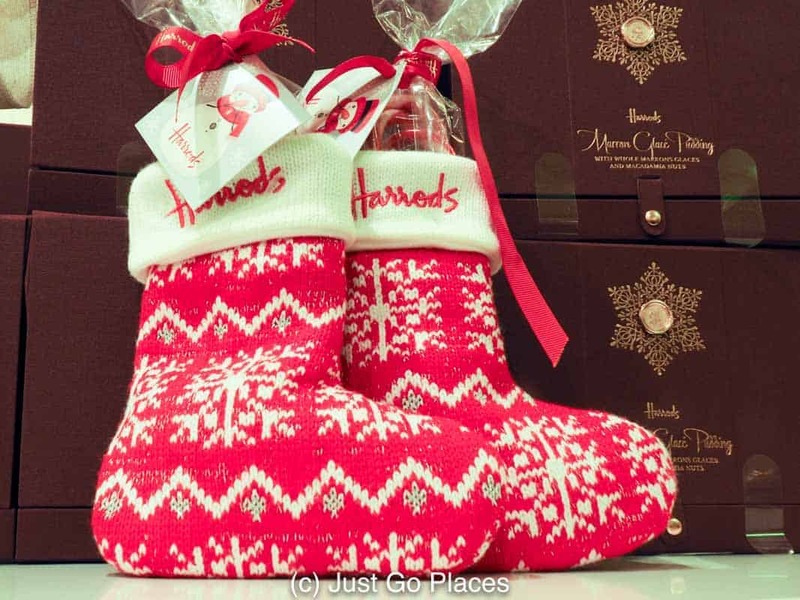 Harrods does OTT very well – they throw heart and soul into it. I mean seriously – this is the most restrained I’ve ever seen it look. Not sure why that is the case this year. Love the holiday season in London. Everything looks so festive! Must plan to get back to London in this time of the year. London looks great over the holidays. The daylight hours are short but all the lights make it appear brighter. That’s true. I love seeing how cities do their end of year decorations!